When we launched Cielo MedSolutions, a SaaS provider of population management healthcare apps, in 2006, my co-founder and I assumed we'd be able to raise venture capital. After all, we both had track records of having built and run software businesses and making money for investors. However, we failed to raise VC funds, and had to settle for a far more modest amount of capital from a combination of angels, economic development agencies, non-profits and federal grants. Partly as a consequence, we grew considerably more slowly than we had hoped. We ended up with a nice exit -- sold to The Advisory Board Co. (ABCO) a little over four years later -- so nobody's feeling sorry for us. But, it wasn't the big splash we set out to create. Related: You Can't Get VC Funding for Your Startup. Now, What? This experience -- combined with observing hundreds of other startups -- motivated me to look more closely at these tough questions: As you're thinking of launching a business, or looking to take your existing business to the next level, should you aspire to raise outside financing? And if so, what types of funding sources might consider your business to be an attractive investment? VCs? Angels? Friends and family? None of the above? Related: Is the VC Era Over? Let's Hope So for the Sake of Business. The x, or horizontal, axis of the Startup Fundability Matrix indicates capital efficiency (ranging from low to high). All other things being equal, outside investors prefer to put their money behind a business that's capital efficient, meaning that for every dollar invested, it's good at producing strong returns on a dollar-for-dollar basis. On this scale, the more "investable" businesses tend to be those that (a) require only a modest amount of capital to launch, and/or (b) can be scaled dramatically and efficiently by injecting just a modest amount of additional capital. The y, or vertical, axis denotes valuation multiples (again, ranging from low to high). Valuation is the value of the company, or its overall financial worth to investors. Since early stage companies are privately held, and therefore don't have a stock price you can look up on a public exchange, investors often use patterns from comparable companies to estimate the valuation of a startup. The most commonly used metric is the valuation multiple -- that is, how much certain types of companies are typically worth, measured as a multiple of the last 12 months' earnings (profit) or revenue (total sales). In general, businesses that achieve high valuation multiples are those that show three characteristics: high growth potential, sustainably high profitability and strong differentiation versus competitors. Quadrant 1 (upper right): Venture Capital -- Businesses have a combination of high valuation multiples and high capital efficiency -- inexpensive to launch and/or inexpensive to scale; these startups are the most attractive to VCs, corporate strategic investors and organized angel groups (which often behave like VCs). Quadrant 2 (upper left): Patient Capital -- These companies share the high valuation multiples with Quadrant 1 firms, but are less capital efficient, often because they lend themselves to less rapid scaling due to addressing a more modest market. These businesses tend to be better suited to investors who are more patient and perhaps less oriented toward pure financial returns -- such as friends and family, specific angels with a special affinity for your particular sector, federal government grants, or state and local small-business loan programs. Quadrant 3 (lower right): Bootstrap -- These businesses rank relatively poorly on the scale of valuation multiples; on the other hand, they tend to be capital efficient (inexpensive to launch and scale). Think of Quadrant 3 firms as cash-flow or lifestyle businesses. It's often possible to get such a business up and running with a modest investment out of savings or a bit of credit card debt. Quadrant 4 (lower left): Dead Zone -- Businesses here are extraordinarily hard for entrepreneurs to finance, and for good reason -- they require a lot of capital to launch, and once up-and-running, are simply not that valuable. As a consequence, outside investors tend to run away from such startup ideas. Circling back to Cielo MedSolutions, we launched the company assuming we were in Quadrant 1, an "investible deal" for VCs. We were wrong, because most healthcare IT-oriented VCs, while feeling comfortable with the high valuation multiples in our sector, suspected that we were too niche-y -- addressing too modest a market -- to be dramatically scalable post-launch. Although we didn't have the benefit of the Startup Fundability Matrix at the time -- and hindsight is 20:20 -- what the VCs were effectively signaling to us is that we belonged in Quadrant 2. We raised a couple of million dollars from a blend of "patient capital" investors. Had we known our "quadrant" up front, we could have saved a lot of time pitching VCs, and redirected our efforts toward selling to customers, building industry alliances and the like. Alternatively, this clarity of thought might have motivated us to explore broadening our product offering. 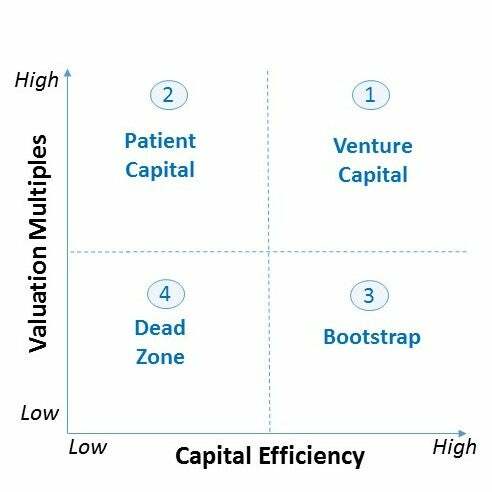 If you think you're high on the y-axis (i.e., high valuation multiples), then the primary determinant of whether you're in Quadrant 2 (Patient Capital) or 1 (VC) is market size. Narrow or niche product businesses push a company to the left (Quadrant 2), while very large addressable markets and broader product platforms tend to push a company to the right (Quadrant 1). If, for instance, you're an entrepreneur with a passion for buying and selling used musical instruments, a Quadrant 3 approach might be to open a brick-and-mortar store, with all its associated overhead and geographic constraints. Tough to get financed, so you'll probably need to bootstrap it. Alternatively, you could pursue a Quadrant 2 (or even possibly 1) business model and create a re-commerce marketplace where your website enables sellers/consigners of instruments to find interested buyers. By making that business model shift, you're tying up less capital in a physical store and inventory, while broadening your geographic reach, profitability and scalability.